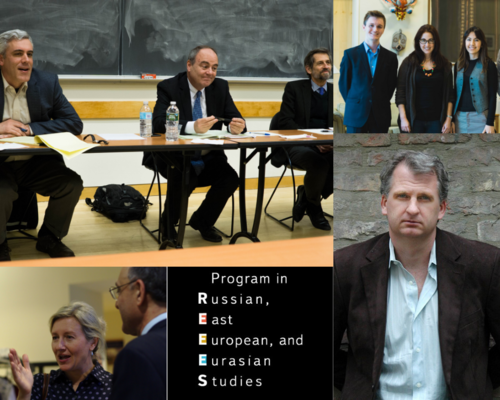 The Program in Russian, East European, and Eurasian Studies (REEES) at the Whitney and Betty MacMillan Center for International and Area Studies at Yale was established in June 2018. REEES gathers and institutionalizes Yale’s longstanding and emerging strengths in research, teaching, and public outreach about this part of the world, including those housed the Faculty of Arts and Sciences (Slavic Languages and Literatures, History, Film Studies, Anthropology, Economics, and Political Science, and others), and in the professional schools, including the Yale Schools of Art, Drama, Management, Music, and Public Health, as well as the Jackson Institute for Global Affairs. This website serves as the central repository for information on Russian, East European, and Eurasian studies at Yale, including courses, research, events, news, and links to related programs. REEES activities span every career stage, from supporting undergraduate and graduate students interested in preparing for careers in Russian, East European, and Eurasian affairs to hosting distinguished visiting scholars from around the world. With support from the MacMillan Center at Yale, the European Studies Council, the Carnegie Corporation, and others, REEES organizes high-impact international conferences, supports a speaker and film series, brings specialists to Yale to teach timely courses, and fosters improved connections among Yale’s programs and schools. We invite wide participation in the many programs and events we are planning for this academic year, and we are looking forward to meeting with you as we develop and expand our programs in the coming years.